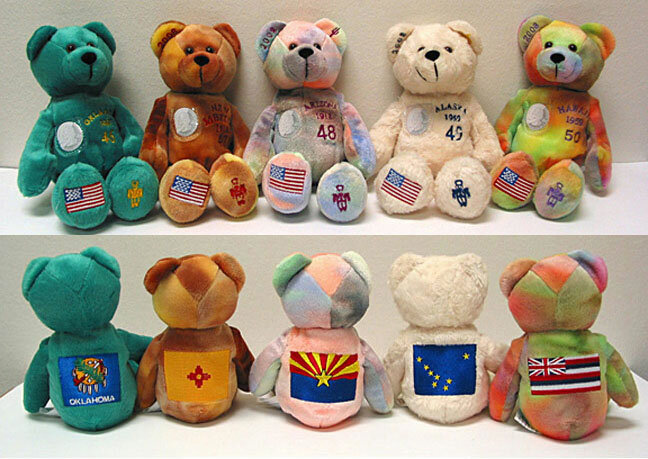 Collectors Corner " 50 State Quarter Bears, Buffalo Nickel Bears, Lewis/Clark Nickel Bears & Sacagawea Dollar Bears"
Selling out & Going fast. 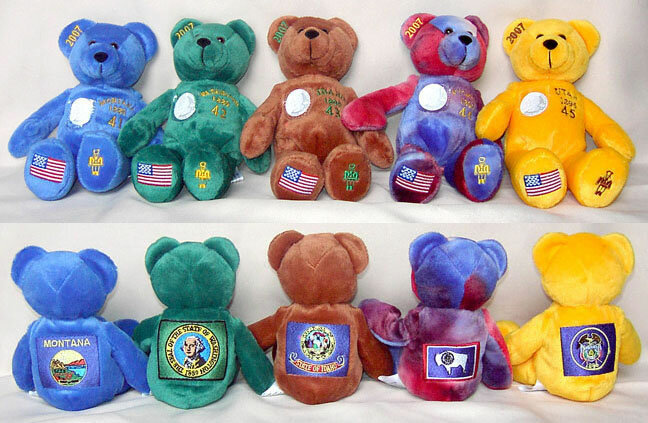 These high quality, greatly detailed bears are the latest market sensation. 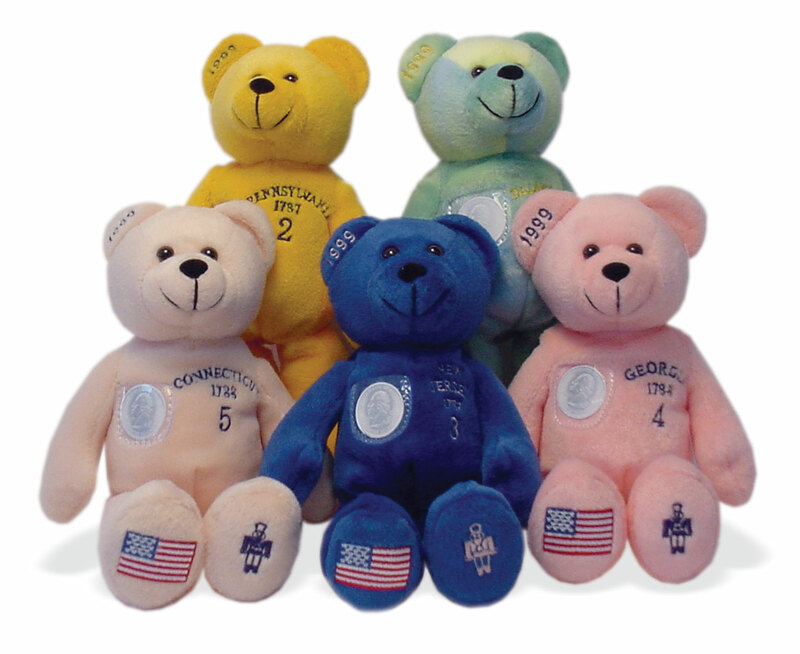 They're collectible, educational, and wonderful gift items for any occasion. 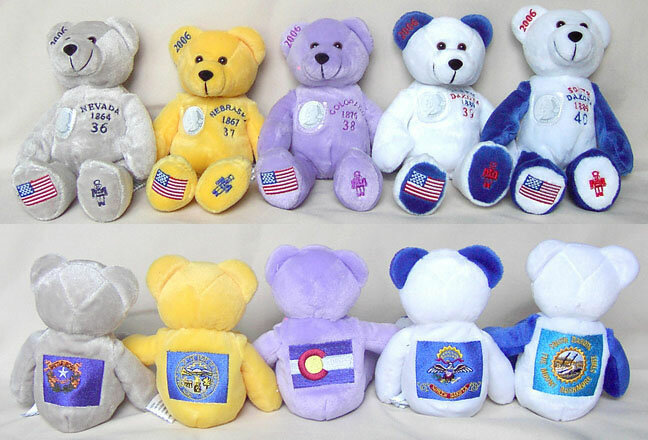 Each bear is beautifully embroidered with the State's name, year of entry into the union, and the number of the release on its left chest. On the right chest is a clear vinyl pocket to hold the matching State's coin. 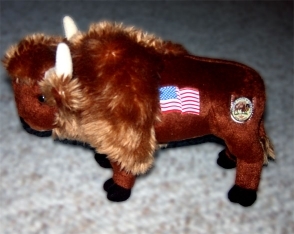 On the back is a two inch by one-and-a-half inch embroidered State flag. 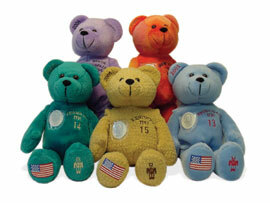 The bear's right ear is embroidered with the coin's mint year. 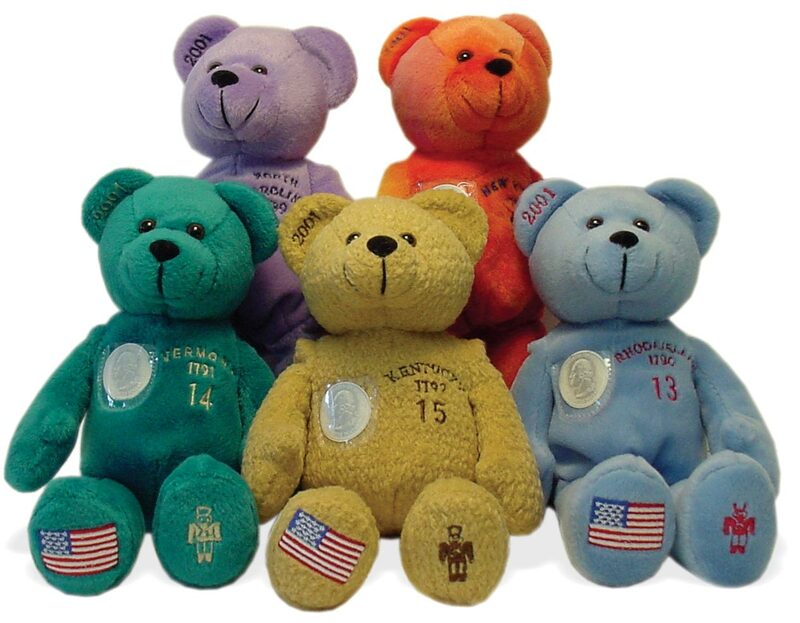 The bottom of the right foot is embroidered with the U.S. flag and the left foot is embroidered with the Timeless Toys soldier trademark. The quality and the detail of the embroidery of the bears is exceptional. 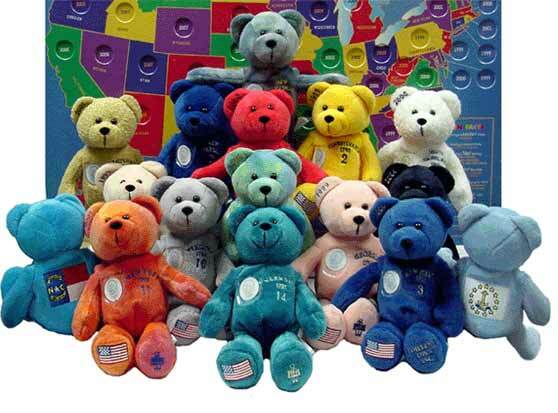 Once they are gone we may never be able to get them again. 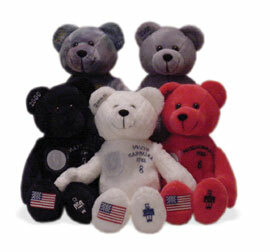 E-mail for availablity and we can put your name on the Bear you want and hold it for you. "CLICK ON PICTURE FOR LARGER VIEW"
(CLICK HERE) Order form for this page ONLY ! 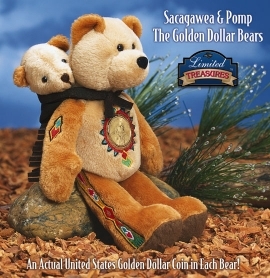 The Sacagawea Bear by Limited Treasurescomes with the actual 2000 Golden Sacagawea Dollar in uncirculated condition sealed on the chest of every bear . 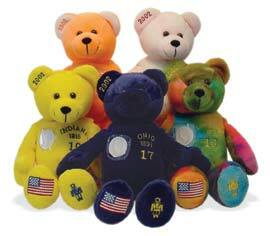 This is an outstanding true collectible put out by Limited Treasures. 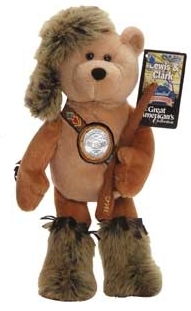 Comes with $1.00 Sacagawea dollar coin included. 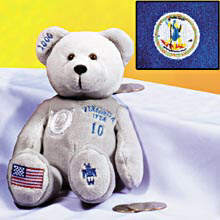 #CC-1064 Clark Commemorative Nickel Bear with a 2004 nickel in uncirculated condition sealed on the chest of every bear . 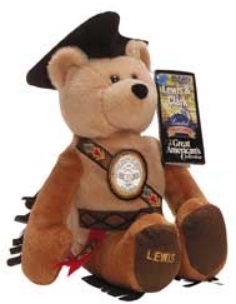 #CC-1065 Lewis Commemorative Nickel Bear with a 2004 nickel in uncirculated condition sealed on the chest of every bear . Order form for this page ONLY ! We will accept Cash, Check, Money Order or Credit Card.